Ada County Highway District (ACHD) has a state-of-the-art Traffic Management Center (TMC). The TMC initially controlled only ACHDs traffic signal system and arterial street camera system. ACHD has been working with the Idaho Transportation Department (ITD) to make this a joint center that controls operations on all arterial streets within Ada County and the Treasure Valley freeway system. As incidents are detected on the freeway system, messages can be posted on variable message signs and vehicles can be diverted to parallel arterial streets. The operators can then change the signal timing to those arterials to accommodate the increase in traffic flow. The ACHD, in a partnership with the Idaho Transportation Department, has installed 159 incident management cameras within the Treasure Valley. 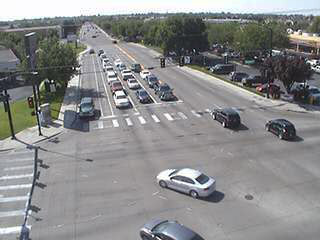 There are cameras on major arterials in Ada County and cameras on I-I84 and I-84. Future plans call for a camera to be located every mile on the freeway system within the Treasure Valley and on most major arterials. ACHD sends camera feeds to various police dispatch centers, the Ada County Sheriff, Idaho State Police, and local TV and radio stations via a dedicated fiber optic communications network. The incident management system is a live feed only. Nothing is ever recorded.